A lot has changed since 2015 when we last updated our blog. Not only have our lives changed but the restaurant business in Connecticut has changed dramatically as well. When we started writing in 2012, people in Connecticut seemed to favor chain restaurants over local ones. In 2017, the opposite seems the rule with new fusion, ethnic, organic and local sourcing restaurants popping up all over the state. The same can be said of wineries and breweries as well. In our state’s tough economic times, people are looking for an escape when they go out. They are looking for something new and exciting. The Rooster Company in Newington has tried to be that something new for Newington residents. Atmosphere: 9.5/10- Several restaurants have occupied the location prior to The Rooster Company’s opening. While the building has always maintained a rustic feel to it, the current owner has done much to authenticate the place. 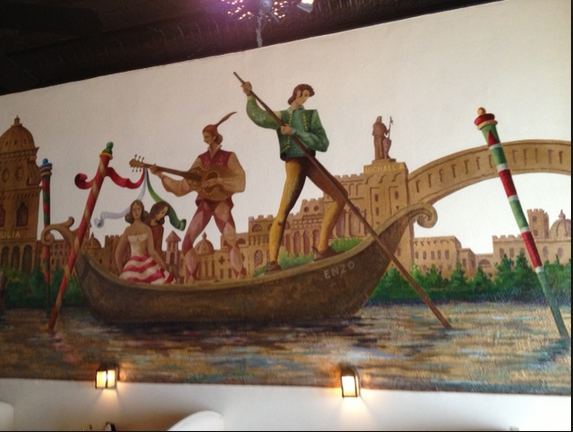 Local artist and chef Andres Montiel has adorned the restaurant with numerous appeasing paintings. Some parts of the restaurant are more privy to these paintings than others. The restaurant also offers comfortable seating for its customers and an open bar. 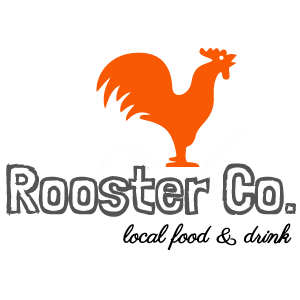 Service: 9/10-On weekends, the Rooster Company can be awfully busy and on one visit, we had to wait a little longer than expected for our food. The wait staff, however, has always maintained a cheerful and respectful disposition that makes one feel welcome, no matter how busy they are. The owners, Chef Kenneth Ward and his wife Jaime Ward, have worked in the restaurant industry for more than 40-years. One can tell they take pride in their business and customers. They also make a point to use local ingredients to create their cuisine. Price/Selection: 8.5/10-This category caused us to have mixed feelings. One can have a filling meal by ordering a half rotisserie chicken and side. 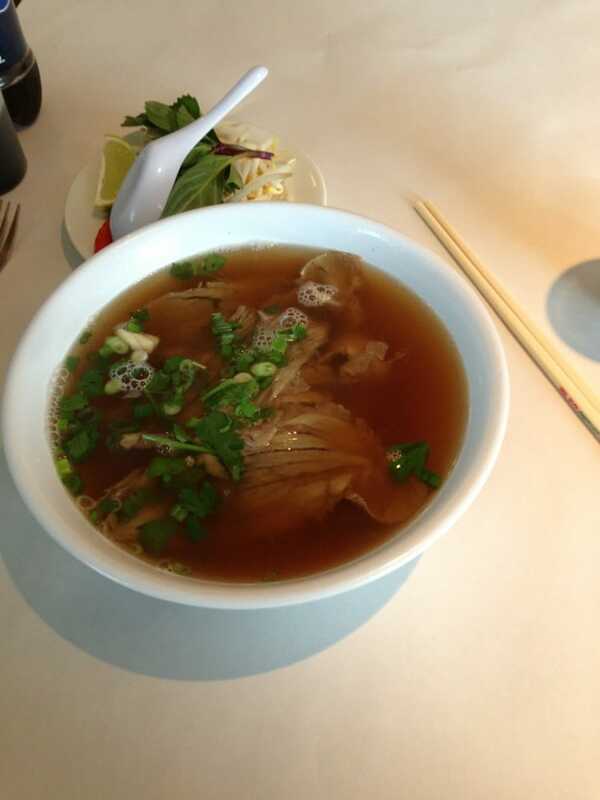 The main dishes, however, range from $17-29 dollars. If you plan on eating any of the main entrees, we recommend that you carry a few extra bucks with you. Their lunch menu is more affordable, ranging from $12 to $16 per entree. If you stop by for brunch, you can expect to pay no more than $14. Despite the high prices on some dinner menu items, the Rooster Co. compensates with a wide variety of dishes that range from seared salmon to arctic char. Their drink menu also has a wide variety of drafts, cocktails and wines. They also have specials such as TH’ACO THURSDAYS to keep frequent customers interested. Taste: 9/10-This picture from The Rooster Company’s website captures the deliciousness of their rotisserie chicken, their signature menu item. The chicken is savory, especially when topped with its fire fire lemon, walnut herb, not so hot, ‘Tandoori’ yogurt or Cola BBQ sauce. The main dishes are equally savory, especially the risotto braised lamb. We only wish the sides carried as much mouth watering flavor. In a nutshell: 36/40- We have enjoyed our experiences at The Rooster Company over the past couple of years, especially devouring the rotisserie chicken, experiencing the rustic feel and admiring the paintings from acclaimed local artist and chef Andres Montiel. While our bill sometimes runs a bit high, we always leave full and satisfied. Recommendations: The name of the restaurant is The Rooster Company, but to our knowledge, rooster is not an option on the menu. With the collective expertise of the chef team, we believe they could cook up a delicious Coq au vin or capon! It always fascinates us to see restaurants develop a cult following. When people typically think of the phrase “cult following,” they apply it to movies, bands, television shows or occasionally novels. Restaurants develop cult followings when they offer something new and exciting to customers. When GoldBurgers opened in Newington, residents developed a love for their savory burgers, terrific staff and creative specials. The word spread fast and GoldBurgers quickly earned the reputation as one of the best burger places in Connecticut. Since its opening a couple of years ago, The Sloppy Waffle has started to earn a similar reputation as evidenced by almost 2000 likes on Facebook and an endorsement from Bob Kaufman, the founder of Bob’s Discount Furniture. 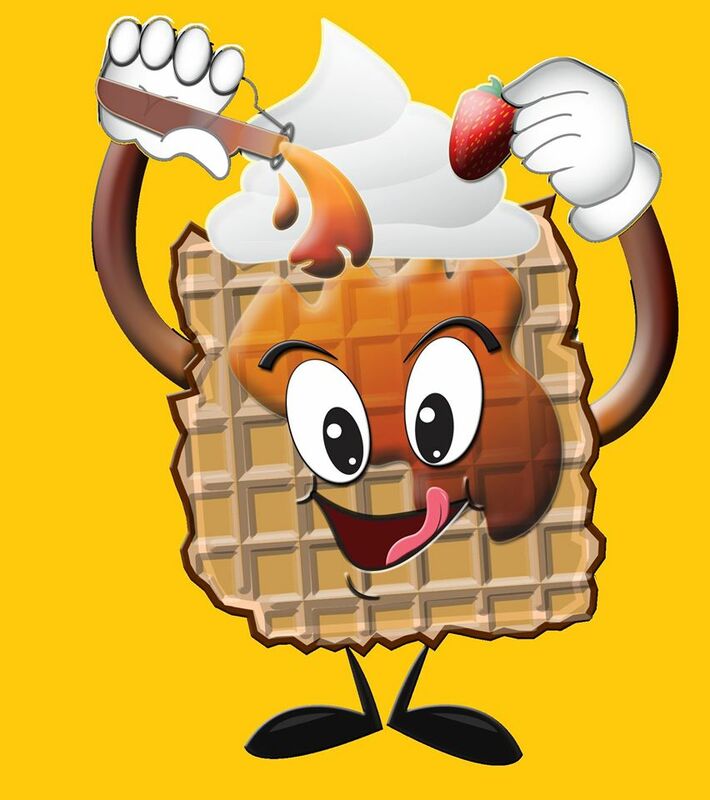 Would The Sloppy Waffle develop the same “cult following” that GoldBurgers has? We had to find out for ourselves. 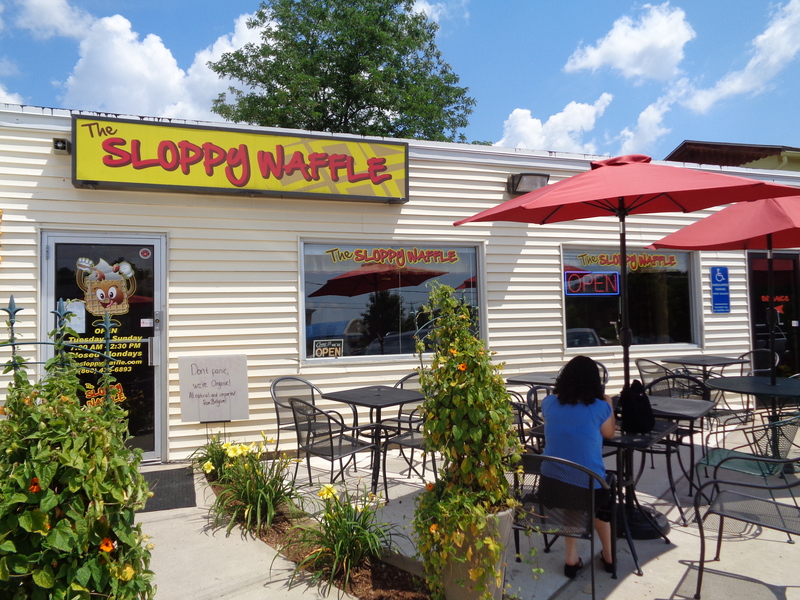 Atmosphere-9/10: The Sloppy Waffle has a certain charm about it in both its interior and exterior. When we entered the restaurant, we noticed plenty of decorative pictures on the walls along with signs detailed with humorous sayings. Several restaurants down south decorate their interior in a similar fashion. During the spring and summer months, customers can sit outside and enjoy their waffles under quaint little tables with red umbrellas. On a sunny, Saturday morning, it’s a picturesque place to be. Service: 8.5/10-The staff members at The Sloppy Waffle always have a cheerful disposition and try their best to satisfy customers. While the restaurant can be quite busy and sometimes understaffed, we were never dissatisfied by their attempts. One fact about The Sloppy Waffle that we found interesting and somewhat strange is that they do not accept credit cards. Instead, they have an ATM machine in the lobby to make up for the trouble. This works to both The Sloppy Waffle’s advantage and detriment. The cash only policy will remind some customers of a more innocent time when most restaurants were of this mindset. For younger customers, the historical resemblance will be lost upon them. Price/Selection: 8.5/10-The Sloppy Waffle offers a unique selection in terms of their specialty waffles. When customers open up the menu, they are often taken by the variety and the creativity of the waffles. Some of the more unique selections include chicken and waffles, apple cobbler, chocolate lover and s’mores that are gluten free. The restaurant also offers eggs, burgers and an option that allows you to build your own waffles. In terms of the price to portion ratio, the waffles tend to be smaller than some customers would expect for what they pay. The waffles, however, are quite filling with a side of eggs, bacon or sausage. Taste: 9/10-We have visited The Sloppy Waffle several times since their opening two years ago because we have been consistently satisfied by their entrees. While some Yelp and Facebook users would beg to differ, we consider their specialty waffles to be delicious in terms of their taste and texture. 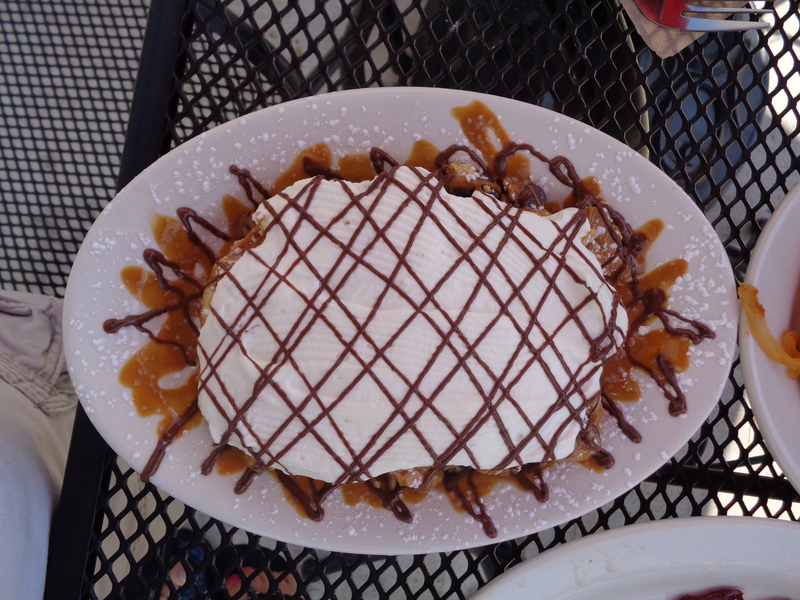 We were especially taken by their chicken and waffles dish along with their s’mores waffle. The chicken and waffles dish impressed us because of how well the staff succeeded in replicating a southern favorite in a New England Kitchen. The s’mores waffle was so delicious that it inspired us to go out to Price Chopper and buy ingredients to make the real thing. In a nutshell: 35/40-Despite a few kinks, we wouldn’t be surprised if The Sloppy Waffle becomes a Newington classic and earns a cult following. The restaurant has improved since its humble beginnings and we expect it to continue to improve as long as it maintains its dedicated staff and has a presence in Newington. As the town of Newington continues to transform into a hot spot for hole in the wall restaurants, it’s nice to see The Sloppy Waffle contribute to that reputation. Since 2012, we at CTSnapshot have done our best to review Connecticut’s fun and food. 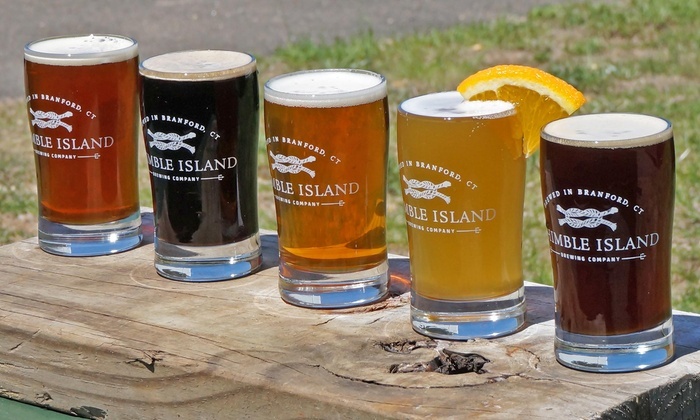 We have focused more on the “food” aspect of that phrase in recent years, however, because Connecticut has so much to offer in terms of its diverse restaurants. In 2015, we will do our best to deliver reviews with respect to both because we want residents to never stop exploring what their state has to offer in terms of its activities, entertainment and cuisine. In 2015, we will continue be honest and sometimes blunt about our experiences because our readers deserve to know the truth about the quality of the places we visit. Check out the list below for a sneak peak of our season 4 reviews. This is a tentative list and by no means a comprehensive one. If you have any recommendations about restaurants or other establishments we should visit, we would love to hear your suggestions! We believe reviewers have the responsibility of being both thorough and honest in their content. Long before we started CT Snapshot, Christina and I frequented websites such as Yelp and Urban Spoon to help us find the best places to eat in Connecticut. The reviewers who posted thorough and honest content proved the most helpful. As bloggers, we have the responsibility to do the same for our readers given our platform and reach. When we visited the Venetian restaurant in Torrington back in October we knew that we owed it to our readers to tell the truth about our experience. 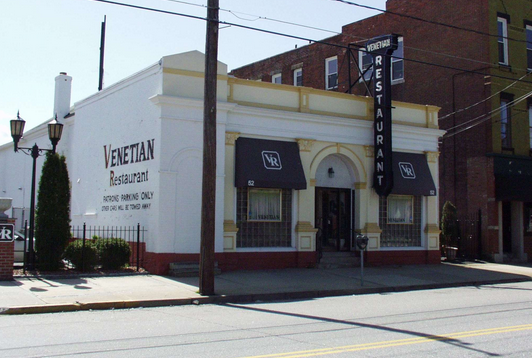 The Venetian Restaurant is the only one of its kind in the state of Connecticut. It was started by Italian immigrants in 1960 and developed a reputation as a renowned restaurant since then. We respect and appreciate the legacy of this restaurant because of our adoration for history and our love for stories about the American Dream. Like the DilLullo family, our grandparents and great grandparents immigrated to this country to contribute something beautiful and meaningful. The original owners of this restaurant undoubtedly made this contribution to the town of Torrington. A place with such a great legacy, however, must be maintained by people who love and care for it throughout the years. Unfortunately, the Venetian restaurant failed to capture our hearts due to poor service and mediocre cuisine. Atmosphere: 9/10-When we stepped inside the Venetian Restaurant, we noticed that the owners were making a considerable effort to immerse the customers in the culture of Venice. The paintings on wall were indicative of the city throughout the ages. The fancifully decorated tables showed a willingness to make customers believe that they were receiving a fine dining experience. The paintings on the wall spoke to my own experience in Venice. This particular painting (shown to the left) reminded me of my first gondola ride, minus the men in clothing of a different era. Others paintings reminded me of the beauty of Venice at any time of year. Price/Selection: 8/10-The menu items are borderline expensive, but this is not out of the ordinary for Italian restaurants. Many Italian restaurants across the state of Connecticut tend to charge upwards of twenty dollars or more per menu item. While the restaurant’s seafood dishes average $20 or more, pasta dishes cost no more than $17. The Venetian Restaurant also offers a theatre menu for people attending a show at the Warner Theatre. This speaks to their awareness of their customers’ needs and makes them a viable option for theatre goers on a tight schedule. Service: 5/10-The service is what soured our experience. We fully realize that one waiter or waitress is not representative of every staff member at a restaurant. One waiter or waitress, nonetheless, can leave a lasting impression on any customer. Our waitress first showed us an awareness of our needs. We asked for the show menu and she informed us that she would serve our food in a timely fashion. From there on, our waitress berated us with rude comments such as “make up your mind” and “I’m going to bring you a vase of water because you’re drinking a lot” instead of asking us if we wanted one. She also scoffed at us when we thanked her for bringing us our check. We were saddened that we treated our waitress with the utmost respect and she showed us none in return. Taste: 7.5/10-We wanted to enjoy our fish and pasta cuisines, but they left much to be desired. These dishes were nicely decorated and assembled in a way that speaks to the chef’s culinary talent. We were excited to try our dishes because we read numerous reviews that described them as “savory” and “delicious.” While the dishes offered a palatable texture, they lacked the savory quality we had expected. They satisfied our hunger, but left us wondering about the delicious Venetian cuisine that oh so many customers have spoken of over the years. In a nutshell-29.5/40-In our experience, The Venetian Restaurant fell short of its established legacy. We are open minded people and would be willing to give it a second chance, but unfortunately the service and food soured our first impression of the restaurant. We hope that if any staff members from the restaurant ever read this review, they will remember to value their customers and honor the restaurant’s great legacy. We encourage you to experience The Venetian Restaurant for yourselves and tell us if it measures up to your expectations of it.